Cool. Revocation has always been one of those solid & reliable, middle-of-the-road bands for me. I always manage to miss them on tour though. Now I have another chance! Sounds like everything else they've done. I'm not complaining, though. I think consistency is the most underrated trait in music. Not my style of music, totally harmless tech.. But damn that cover art! Anyone knows who the artist is? I have enjoyed their releases, though agreed on them not really doing anything particularly unique or special. Will definitely listen to this one when it comes out. They've been one of a handful of my favorite bands these last ten years, so of course this is as automatic of a pickup for me as it probably gets. Agreed, there's very little that's different about these two songs than what they've been doing but there's nothing to fix that isn't broken, and there does feel like a slightly darker, more warped vibe this time. In that respect, the subject matter fits, and that artwork is beautiful. Pretty sure that's Tom Strom, whom they've had for the last few albums. 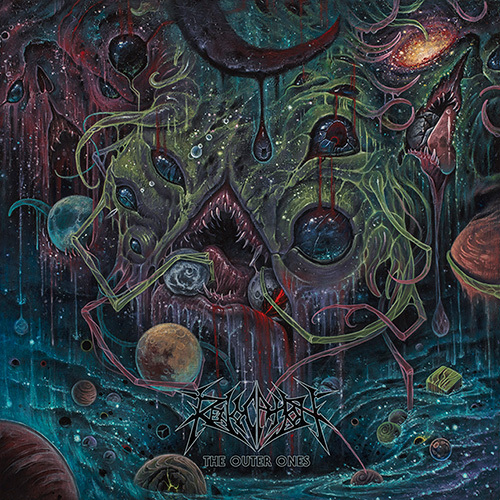 TBDM often gets named for their ability to release albums of good to great quality on a regularly scheduled basis and I understand that, but Revocation deserves at least as much recognition in the same breath. It's the Cannibal Corpse model, and I'd say it's worked out just fine for them. Lovecraft-fueled artwork, i love it ! Azathoth in all its splendor. Musically im not that moved anymore. I didn't buy their last effort, which was quite well done, but wasn't special enough for me to purchase. I absolutely worship their early works, under Cryptic Warning name, and the first albums until Teratogenesis (included). Then it kinda sounds samey and less inspired. Deathless had a some solid material though. This new song feels meh on the first half, then lifts off a bit, and ends with an appealing meshuggah-esque/gorguts-esque pattern (without it to be too long and migrainous). Of Unworldly Origin left me cold but this second excerpt gave me new hopes. While I agree that Revocation is just as consistent, TBDM has been doing full-lengths for 5 more years than Revocation, and they're a lot more popular, so that's why they get the recognition. I am listening to it now. It's great. I enjoy it a lot more than their previous albums. It definitely leans much more into the death metal side of their sound. Been listening to it for the past few days. I have to say, it suffers from the same issue I've had with previous Revocation albums: there's a few really great songs, and the rest is just not worth hearing. On Chaos of Forms it was Cretin, Cradle Robber, No Funeral, and Beloved Horrifier that were leagues ahead of the rest of the album, on Existence is Futile it was Pestilence Reigns, Deathonomics, and Re-Animaniac; on this one, it seems to be Fathomless Catacombs, The Outer Ones, and Luciferous. The rest of the album has kind of just gone in one ear and out the other. Every album has a couple of songs that are just fantastic, but they never seem to put out an entire album of that caliber. I do have to say, though, this is the raddest cover art ever to grace one of their albums. I kind of agree. I usually tend really to like some songs by Revocation whereas I find the others just alright. Typically, the faster, thrashier ones are the ones I like more. Having said that, I listened to the full album yesterday and it was nothing stand-out to me. It was great, but I find most of their stuff great. It didn't stick out too much from their other albums.